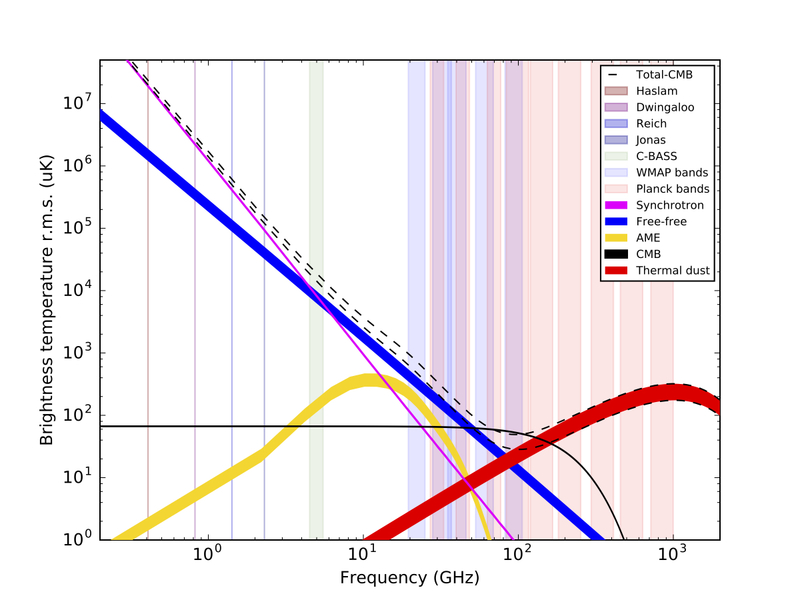 The principal aim of C-BASS is to allow the subtraction of polarised Galactic synchrotron emission from the data produced by CMB polarisation experiments, such as WMAP, Planck, and future B-mode polarisation experiments. To map the local (≤ 1 kpc) Galactic magnetic field and improve our understanding of the propagation of cosmic rays through it. To study the distribution of the anomalous dust emission in order to better understand its origin and the physical processes which affect it. To improve the modelling of Galactic total intensity emission, and hence allow CMB experiments access to the currently inaccessible region close to the Galactic plane. Achieving the aims outlined above requires that, at a minimum, the polarised Galactic foregrounds can be subtracted to below the sensitivity levels of e.g Planck at all the angular scales covered by these experiments. In hard numbers this means an rms noise level of < 100 µK per pixel, and an accuracy of 5% on scales of up to 10˚. Our goal is to produce a substantially lower noise level and reduce systematic errors to well below the 5% level on scales up to the quadrupole, in order to complement a B-mode satellite. Polarised radiation can be described by the Stokes parameters: I - which specifies the total intensity; Q and U - which specify the linear polarisation; and V - which specifies the circular polarisation. Circular polarisation is not expected from the CMB and is negligibly weak for the foregrounds. The primordial B-mode spectrum is predicted to be quite smooth, so an important check on this would be the detection of its one feature, the peak at l ≈ 90. To be certain of its detection we need measurements up to l ≈ 150, which fixes the resolution of the survey to about 1˚. The frequency should be as low as possible, to avoid contamination from the CMB and foregrounds other than polarised synchrotron, and to provide good spacing in log(ƒ) for the accurate determination of spectral index. However, if the frequency is too low the measurements are contaminated by Faraday rotation. The optimum frequency turns out to be 5 GHz. A bandwidth larger than 1 GHz (20%) runs the risk of contamination from man-made radio sources, and suffers from large colour corrections - spectral index dependent calibration offsets. A 1 GHz bandwidth allows ample sensitivity to map the whole sky with a few months of observing in each hemisphere. 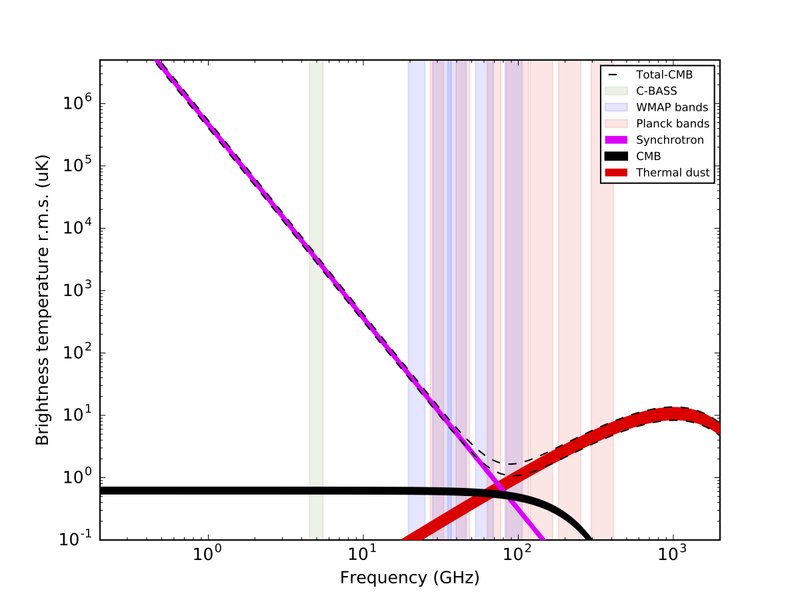 A signal-to-noise ratio of >5:1 over >90% of sky pixels in each survey is sufficient to extrapolate to the CMB band with errors below the level of lensing 'noise'. Frequency spectra of diffuse foregrounds in temperature , also showing the observing bands of selected experiments and including C-BASS. Frequency spectra of diffuse foregrounds in polarisation, also showing the observing bands of selected experiments and including C-BASS.